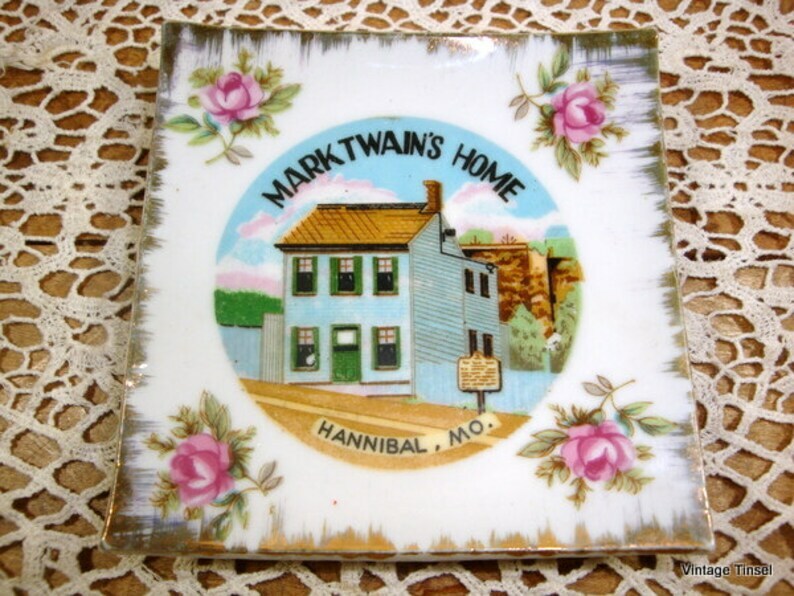 Nice souvenir plate with a picture of Mark Twain's home in Hannibal, Missouri. Small, measures about 4 3/4" square. Plate is slightly bowled in shape. Gold trim with pink roses in each corner. Colorful picture of the home. Back has a rim so the plate will stand out slightly if hung on a wall, you would need to add your own hook. Made in Japan. Tiny chip on back side of plate along the rim, otherwise in good vintage condition. No cracks or glazing of finish noted. More decorative plates? Combined shipping is available.